Halloween is supposed to be scary for the costumes, haunted houses, and razor-blade laden candy, but this year is really special. Researchers have recently proclaimed that October 31 will be the first day that the world will have seven billion people. It’s a scary thought, but the world is rapidly shrinking – or at least its resources are, by the growing amount of people using them up. People are now starting to ask the question, how many people can we handle? The answer had better be high, because we’re expecting another few billion in the next half-century. In 1798 Thomas Malthus, an English priest and economist, enunciated his general law of population: that it necessarily grows faster than the food supply, until war, disease, and famine arrive to reduce the number of people. As it turned out, the last plagues great enough to put a dent in global population had already happened when Malthus wrote. World population hasn’t fallen, historians think, since the Black Death of the 14th century. 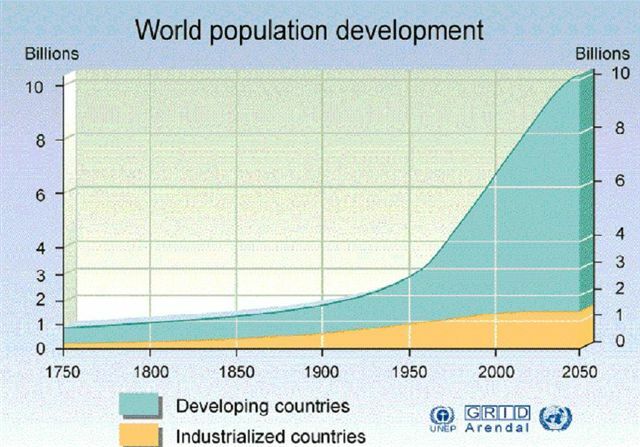 In the two centuries after Malthus declared that population couldn’t continue to soar, that’s exactly what it did. [...] And the explosion, though it is slowing, is far from over. Not only are people living longer, but so many women across the world are now in their childbearing years—1.8 billion—that the global population will keep growing for another few decades at least, even though each woman is having fewer children than she would have had a generation ago. By 2050 the total number could reach 10.5 billion, or it could stop at eight billion—the difference is about one child per woman. UN demographers consider the middle road their best estimate: They now project that the population may reach nine billion before 2050—in 2045. [...] With the population still growing by about 80 million each year, it’s hard not to be alarmed. Right now on Earth, water tables are falling, soil is eroding, glaciers are melting, and fish stocks are vanishing. Close to a billion people go hungry each day. Decades from now, there will likely be two billion more mouths to feed, mostly in poor countries. There will be billions more people wanting and deserving to boost themselves out of poverty. If they follow the path blazed by wealthy countries—clearing forests, burning coal and oil, freely scattering fertilizers and pesticides—they too will be stepping hard on the planet’s natural resources. How exactly is this going to work? That video comes from Japan, where we literally get jammed into the already packed trains depending on the time and location (i.e., avoid peak hours in Tokyo if you’re claustrophobic). In Japan, the population is growing below the replacement rate, and foreign immigrants are comparatively scarce. So now, just think of places like India, where the population is going through the roof. Perhaps all developing countries will soon be implementing measures like China’s one-child-policy. 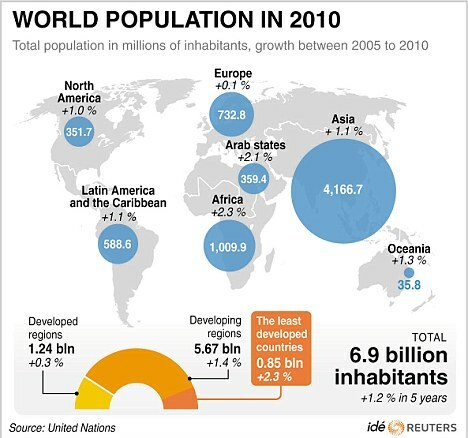 Here’s a picture of the population by region. After World War II the developing countries got a sudden transfusion of preventive care, with the help of institutions like the World Health Organization and UNICEF. Penicillin, the smallpox vaccine, DDT (which, though later controversial, saved millions from dying of malaria)—all arrived at once. In India life expectancy went from 38 years in 1952 to 64 today; in China, from 41 to 73. Millions of people in developing countries who would have died in childhood survived to have children themselves. That’s why the population explosion spread around the planet: because a great many people were saved from dying. Other factors they mention contributing to the population growth is the high birth rate, at least for some time, as well as sanitation and nutrition gradually improving. Here’s a graph predicting where the population is estimated to be heading in the next few decades. But, of course, no one really knows – no one can know. Which is why October 31 is actually a relatively meaningless date – there’s no way of measuring who the exact 7th billion person is… but this is what the research suggests. This year, we’re going to hit a human population of 7 billion. Yet already 1.1 billion people lack access to safe drinking water, 2.6 billion people lack adequate sanitation, and 1.8 million people die every year from waterborne diarrhoeal diseases. Those are not encouraging numbers as the counter ticks up. Population is four times more important than climate change when it comes to water shortages. We are already seeing the effects of shortages around the world, particularly in India and China where populations soar alongside economic growth, as well as in Africa where technologies lag behind. But even in the US, one third of our counties are at high risk for water shortages, if they aren’t experiencing them already — some experts argue we already passed peak water in the US years ago. Where do we stand with our water supplies today, and what needs to change to ensure a future with clean water for everyone? Welcome to the world, seven-billionth baby; whoever and wherever you are. This entry was posted in Biology & Evolution, Culture, Japan and tagged food, population. Bookmark the permalink.